Respect, mutual support, solidarity, and fun: a rich foundation for the blossoming of a wonderful friendship between Marielle Ricard, Françoise Dupont and Carmen Daviault. Theirs is a story of friendships for life, now well into its 15th year. These extraordinary women met at the YWCA Montréal in the early 2000s. Despite difficulties in their lives, including homelessness for some, these “three musketeers” forged a remarkable friendship and solidarity while they were residents at the YWCA. One can’t help but smile, as they recall their meeting and subsequent journeys, constantly interrupting each other, finishing each other’s sentences, and exploding into laughter. the community as a committed volunteer. 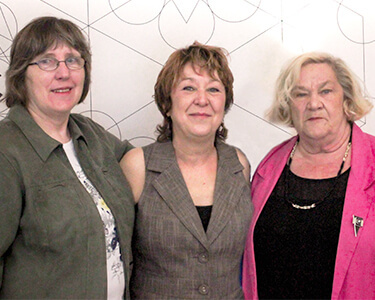 Three women with three different life stories and all found a home at the YWCA Montreal. Overcoming addiction, homelessness, mental health problems and violence for some, physical illness and personal life challenges, for others. Some were looking for companionship and guidance; others struggled with deeper needs. Their personal journeys involved both skill-building and self-esteem development. They discovered capabilities that helped them move forward, some of which were fueled by their meaningful friendship and others from their own hard work. Their achieved success is due in part, to their resilience, the support they found at the YWCA Residence and their special bond. As they would tell it, their friendship began to solidify during activities organized by the YWCA Montréal and its Foundation, including a memorable evening at the Outremont Theatre where they experienced the pleasure of attending a cultural event all together. Other events also stand out, such as sitting together in the television lounge on September 11, 2001, when they witnessed the attacks on the World Trade Centre. Happier times include shared memories of preparing collective meals and countless moments of fun and laughter, simple pleasures that can be rare during difficult times. Today, this group revels in a more gratifying life and despite their busy schedules, these amazing women still make time for fun and have each other’s’ back. All for one and one for all! The YWCA Montreal programs help, not only, those who can’t see the light at the end of the tunnel, but all women and girls, who are experiencing difficulty and recognize their need for help. Carmen, Françoise and Marielle exemplify the organisation’s purpose, and the way it assists people: offering support as they overcome their hurdles, while facilitating and strengthening their social and supportive network. So what’s next on their agenda? Probably a good meal among friends! Along with the support and assistance offered by the YWCA Montréal, the seed of a lasting and meaningful friendship was sewn. Certainly one of life’s greatest treasures!